So far this year, five secularists have been hacked to death with machetes by hardline Islamists in Bangladesh. 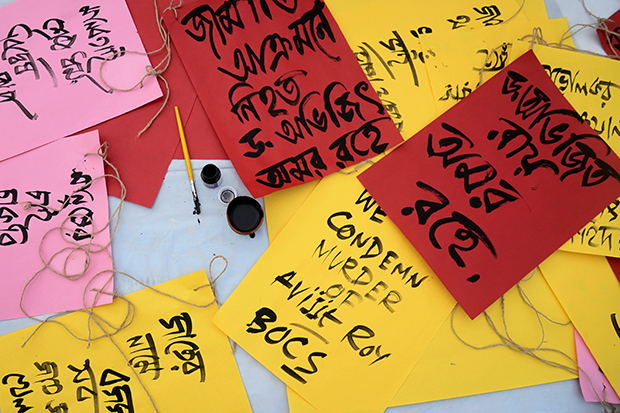 Four writers — Avijit Roy, Washiqur Rahman Babur, Ananta Bijoy Das, and Niloy Chakrabarti — have been murdered, and on 31 October, Faisal Arefin Dipan, who published Roy’s books, was killed at his office in Dhaka. Two secular bloggers and another publisher were badly injured in a similar attack just hours earlier. This spate of attacks began in earnest in 2013, when atheist writer Asif Mohiuddin was attacked with machetes. While he survived, blogger Ahmed Rajib Haider, attacked a month later, wasn’t so fortunate. At the time, the attacks were linked to political tensions over the ongoing war crimes tribunal. Today, the brutal assaults on secularists seem to have taken on a life of their own and the government has failed to take any decisive action, meaning secularists have been marked out as an easy target. “We don’t want to be seen as atheists,” said the prime minister’s son, Sajeeb Wazed, in May. In 2013, militant Islamists issued a hit list of 84 bloggers. Numerous other lists are in circulation. For those who are under threat, the situation is terrifying: amongst the small community of “freethinkers”, as they describe themselves, there is a sense that no one is safe. One blogger, who wrote on feminism and religion who wished to remain anonymous, arrived in Europe on 30 October, the day before Dipan was murdered. “I had direct threats to my life; I stopped blogging but the threats continued and I couldn’t even leave the house. Even now, I can’t believe that I’m safe,” she told me over the phone. Sanyal did not go to the police. He feared outing himself and losing his job. Moreover, he had no reason to believe that the government would offer him protection. Sanyal has also left Bangladesh but his family remains in the country. He asked Index on Censorship not to mention his destination as he still has safety concerns. Bangladeshi fundamentalists recently published an international hit list, including citizens of America and Europe. The clear implication is that nowhere is safe. The letter goes on to explain that the damage inflicted on bloggers isn’t just physical but also mental. With bedroom murders not uncommon, “even staying home fails to guarantee our safety”. Police officers can enter a home at any time to arrest bloggers for “provocative writings”. Such sentiments offer little comfort to those facing a continued and serious threats to their life.